Thanks and thanks for stopping by today and leaving a comment! 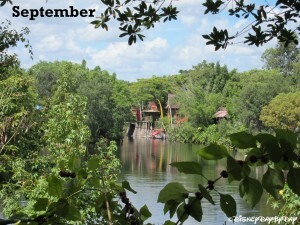 Love these views for a September calendar. Makes me want to go there right now. I agree Beth, it doesn’t take much to make us want to be there as well. Thanks for stopping by today! Great photos as usual! I love the one in Italy. We love it as well, thanks for stopping in today! Beautiful shots! You did it again! They would make such a lovely calendar! Thanks for sharing and for joining in on the Disney WW blog hop fun today! Thanks Deb and thanks for hosting the hop! It’s always fun to see what we have to contribute. Oh, I love the Italy shot – with the storm clouds behind the bell tower – what an evocative mood it sets! That one is our favorite as well. Thanks for stopping by today! They are great spots, thanks for stopping by today and leaving a comment! Gorgeous shots! 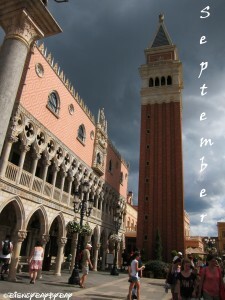 I love the angle on the Italy Pavilion one, just beautiful! Ahhh… Italy’s my favorite. 🙂 I love how you even add the month name. I think you need to get some actual Disney calendars put together and printed – we’d all buy one!! 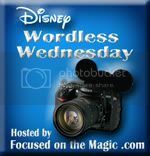 Great theme for Wordless Wednesday! Beautiful scenic shots! I love the Venice photo!